Children see better than adults. It doesn't have anything to do with eyesight, either, and that fact forced me to slightly alter the stars for the cover of The Year Santa Came Back—although I don't like most vastly modified images. I don't, and won't own a green screen. The unfortunate truth is that today's hectic pace dulls awareness, numbs imaginations and minimizes creative time. Most kids are immune until their schedule constricts the freedom that lets them savor little things. Think for a moment about the number of kindergarteners who enjoy spotting different shapes in clouds. Then consider the last time you saw a high school senior laying on the grass watching them float past. Unicorn sightings are more likely. Children see something we've learned to ignore. That's why it would be wrong if my cover reflected an adult's near-sighted view and not youthful vision. I can't stand an image that's a combination of a dozen photos or more, though. Frankenphotos is the term I use. They result in something never seen in nature, light Einstein wouldn't recognize and enough layers and filters that graphic artists I've worked with grew tired of my, "It's alive," proclamation. It wasn't a compliment, either. A technically correct exposure of the stars for the cover of The Year Santa Came Back would be perfect for adults. The image I started with is what they see on cloudless nights, but it's far from what a youngster's keen eye sees. Star's twinkle. Adults rarely have the patience to notice it, but the last time I checked the law of physics haven't changed. Rather than attaching a star filter on my lens—which creates an effect that at least makes a photo hints that there's some twinkling going on—I employed Topaz Labs Star Effects during post processing in Photoshop. The chief problem with hardware is the fact that it would spread house lights in the treeline silhouette everywhere. I'm pretty sure I couldn't have gotten rid of them all. I can limit the area using the software, making it an ideal solution. I have my version running as a plug-in, which is convenient because it's part of my filter menu. It can create a variety of shapes, sizes, etc. and, when needed for a project like this, pretty much ideal. What you see above is the final, twinkling stars/silhouette background I used for the book. I have to warn you, though, some of the different settings in the Star Effect filter can, well, create Frankenphotos. 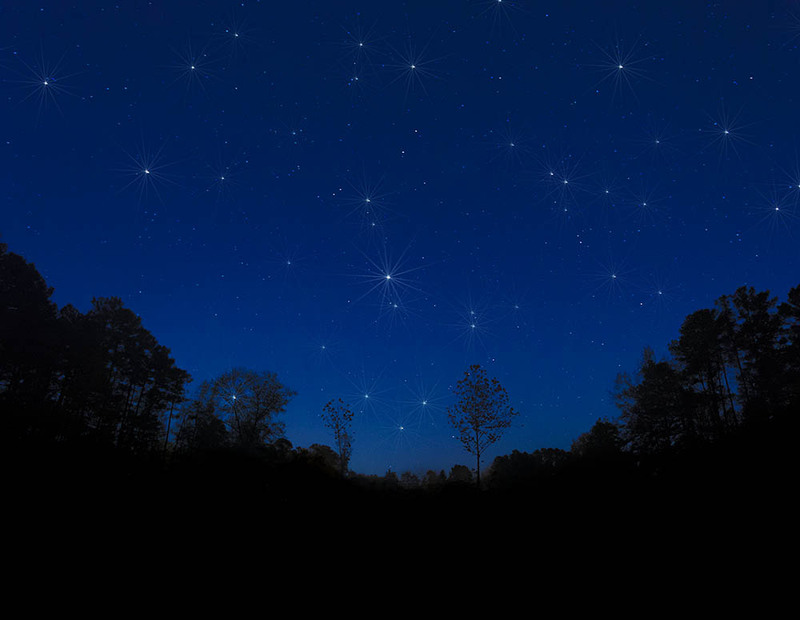 Fade the effect in Photoshop, or even mask out some of the star effects. I did so when modifying the stars for the cover of The Year Santa Came Back....and I think it turned out OK.
At my age, though, I'm still not sure it's what we really see out there. If you have a young reader, let me know what they think. I'll cover the toughest part next—Rudolph's nose streaking across the sky. I tried to get him for the photo shoot, but never heard back. He's humble that way.